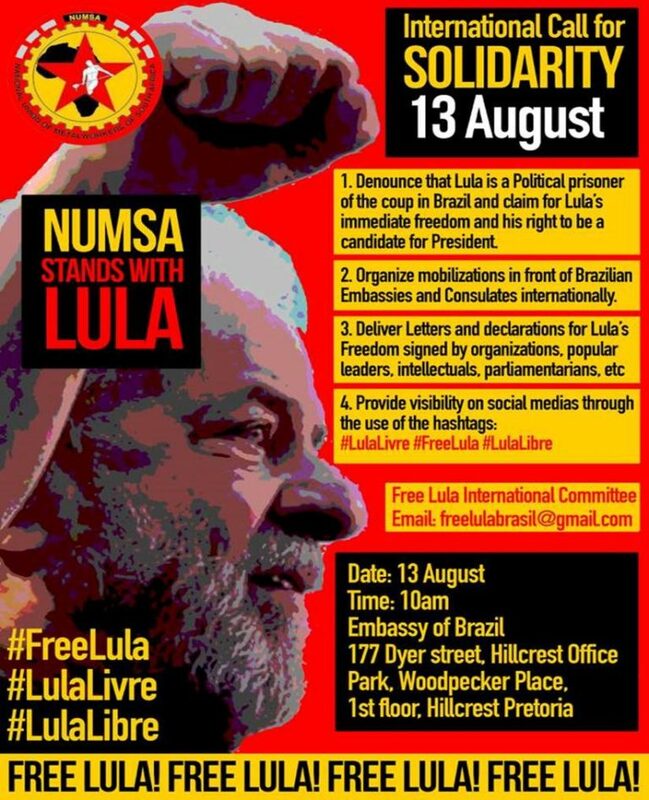 The National Union of Metalworkers of South Africa (NUMSA) in Hlanganani, in Tshwane will be picketing outside the Brazilian Embassy in Pretoria, against the unfair and unjustified imprisonment of former Brazilian President, Comrade Lula Inacio Da Silva. He has been convicted and arrested for the possession of an apartment that never belonged to him, corruption and money laundering. This sentencing was carried out by a biased judge, who drove a vicious trial by media, in order to discredit him and his reputation. The corruption conviction has been widely criticized because of the lack of evidence to back up the allegations. Comrade Lula Da Silva is the victim of arbitrary and brutal acts against popular political activists in Brazil who have been pursued by the government of Michel Temer. Temer is pursuing ruthless neo-liberal macro-economic policies against the working class majority in Brazil. Institutions like the judiciary are being used to persecute Comrade Lula. They want to prevent him from participating in the upcoming presidential elections. Lula’s Socialist policies have helped millions of Brazilians to live a better life, and to escape poverty. He remains one of the country’s most popular politicians. NUMSA is a Marxist-Leninist inspired trade union and in the spirit of international solidarity it is our duty to defend the movement for Socialism. We will be picketing against this miscarriage of justice.